42 www.coalage.com March 2019 suppliers news Conuma Signs Safety Deal With Hexagon Hexagon's Mining division recently announced a significant safety solu- tion deal with Conuma Coal Resourc- es, a Canadian mine operator that produces high-quality metallurgical coal. The three-year subscription package will cover Conuma's three mines near Tumbler Ridge in north- eastern British Columbia. The Brule, Willow Creek and Wol- verine mines employ about 800 staff and account for a fleet exceeding 180 pieces of equipment. Today's deal will ensure the peace of mind and protec- tion offered by the HxGN MineProtect portfolio. "We are extremely excited to be partnering with Hexagon to imple- ment an integrated safety solution that provides protection for our em- ployees," said Mark Bartkoski, pres- ident, Conuma. "We are truly dedi- cated to providing our people with the tools to run a safe, productive and efficient operation that provides se- curity for all of our partners." Used in more than 30,000 vehicles and in more than 60 mines worldwide, HxGN MineProtect Collision Avoid- ance System (CAS) will give Conuma vehicle operators 360° proximity detec- tion at any speed and in all conditions via unobtrusive cabin display units. It's fully integrated with HxGN Mine- Protect Fatigue Pro, which uses proven computer vision technology to monitor operators unobtrusively while driving. Further integration with HxGN MineProtect Tracking Radar will help characterize a potential threat's posi- tion and motion, providing drivers and operators the information they need to prevent incidents. Conuma will use HxGN MineEnterprise Platform, a web-based reporting and analytics solution, to monitor and control crit- ical risk events by connecting a mul- titude of data sources via live dash- boards, visualizing all aspects of CAS. "We're hugely impressed by Conu- ma's commitment to safety," said Hexa- gon Mining President Josh Weiss. "This is a great example of how subscription licensing and an integrated portfolio package adds flexibility while allowing mines to maximize safety. We share Conuma's core belief that protecting people and equipment is the smartest investment a mine can make." 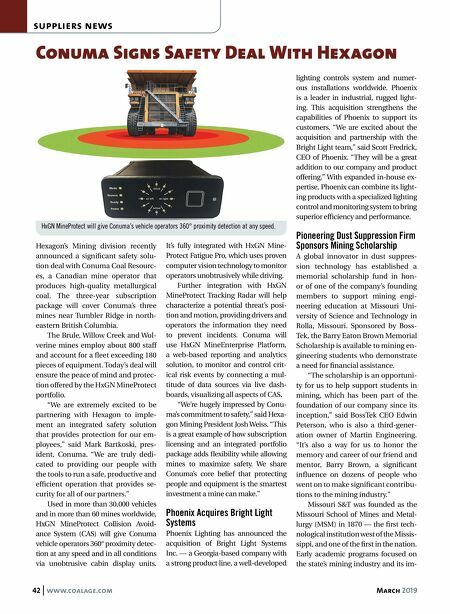 Phoenix Acquires Bright Light Systems Phoenix Lighting has announced the acquisition of Bright Light Systems Inc. — a Georgia-based company with a strong product line, a well-developed lighting controls system and numer- ous installations worldwide. Phoenix is a leader in industrial, rugged light- ing. This acquisition strengthens the capabilities of Phoenix to support its customers. "We are excited about the acquisition and partnership with the Bright Light team," said Scott Fredrick, CEO of Phoenix. "They will be a great addition to our company and product offering." With expanded in-house ex- pertise, Phoenix can combine its light- ing products with a specialized lighting control and monitoring system to bring superior efficiency and performance. Pioneering Dust Suppression Firm Sponsors Mining Scholarship A global innovator in dust suppres- sion technology has established a memorial scholarship fund in hon- or of one of the company's founding members to support mining engi- neering education at Missouri Uni- versity of Science and Technology in Rolla, Missouri. Sponsored by Boss- Tek, the Barry Eaton Brown Memorial Scholarship is available to mining en- gineering students who demonstrate a need for financial assistance. 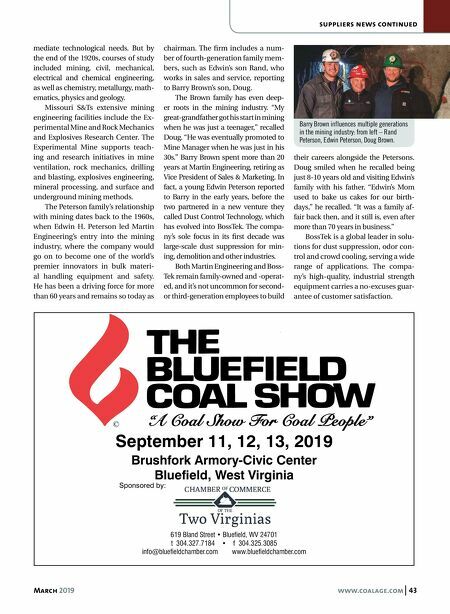 "The scholarship is an opportuni- ty for us to help support students in mining, which has been part of the foundation of our company since its inception," said BossTek CEO Edwin Peterson, who is also a third-gener- ation owner of Martin Engineering. "It's also a way for us to honor the memory and career of our friend and mentor, Barry Brown, a significant influence on dozens of people who went on to make significant contribu- tions to the mining industry." Missouri S&T was founded as the Missouri School of Mines and Metal- lurgy (MSM) in 1870 — the first tech- nological institution west of the Missis- sippi, and one of the first in the nation. Early academic programs focused on the state's mining industry and its im- HxGN MineProtect will give Conuma's vehicle operators 360° proximity detection at any speed.